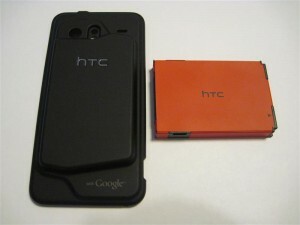 The Droid Incredible (Dinc) and the Tmobile HTC G2 share the same type of battery. However, in the Dinc battery’s stock form it will not fit without a quick 30 second hack. If you take a look at the battery, you will notice that the charging leads are flipped backwards compared to the G2. The only thing preventing you from flipping it around and inserting the battery are two notches on the left and right of the battery. Take a small pair of cutters and simply snip off the little tabs. Then flip the battery around and you got yourself another battery that fits in the G2. Try a test fit before cutting and you will see exactly where to snip the tabs. So why bother doing this when the G2 has batteries readily available? I’ve grown to really like the 1800mAh battery from HTCExpress. Although it states that it’s for the Evo, it will fit the Incredible and now with this hack, the G2. Keep in mind your battery door will not fit right because of the size. Some people have suggested that you can remove the label that is wrapped around the battery to make the battery door fit. I didn’t bother trying this since I am using the Otterbox Commuter case. I just left the door off and the Otterbox slipped right over it without a problem. This keeps the size as close to stock as possible, but with a larger battery. With this setup, I am able to get roughly 15hrs of heavy use with sync on. Give it a shot, you won’t be disappointed.